You are the life of the party and a carefree, vibrant atmosphere is your comfort zone. It&apos;s no surprise that on a weekend getaway you gravitate toward community events, festivals and anything outside the box. Grab some grub at the Farmers’ Market on the square in historic downtown Stevens Point. If the conditions aren’t favorable, buzz through The Market On Strongs (a year-round indoor farmers’ market). Step into the magic of Gepetto’s workshop or get hands-on with creative classes at Clay Corner Studio or Blue Bead Trading Company. Stroll through downtown galleries and murals to experience the arts scene. Arm yourself with a birding guide before heading to Godfrey & Maybelle Erickson Natural Area, tucked along the shores of McDill Pond in Kozcizkowski Park, known for birding with over 170 species documented. Up for a challenge? Order the large cone at Belt’s Soft Serve; then, try to finish it all before it melts! Blow off extra energy with hours of playtime at K.A.S.H. Playground in Mead Park. Stop by Great Northern Distilling to taste spirits crafted from local ingredients. Or visit Central Waters Brewing, Wisconsin’s first green-powered brewery run with over 1,000 square feet of solar panels. 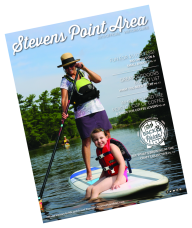 The Stevens Point Area plays host to fun and funky events, including 90FM Trivia (Apr. ), Portage County Cultural Festival (May), MREA Renewable Energy Fair (June), Celebrate Plover (July), Paddle Quest (Aug.), Art in the Park (Sept.) and Central Waters River Run (Oct.). View our Calendar of Events for a full list. Bring the fun outdoors with a high tech scavenger hunt – try your hand at geocaching. For an hour-long excursion, head to Lower Whiting Park for a three-part cache called Down By the Old Mill Pond. Take a tour, attend an educational workshop or enjoy a community potluck at Central Rivers Farmshed. Want to climb rock walls, become a news anchor or create works of art? For families with young children, visit the Central Wisconsin Children’s Museum in downtown Stevens Point to play and learn. Get in touch with your adventuresome side at Standing Rocks County Park, an all-encompassing park known for mountain biking, disc golfing, snowshoeing, downhill skiing and more. Up for a true taste of the Stevens Point Area? Tour the breweries, wineries and distillery that comprise the Central Wisconsin Craft Collective. Please drink responsibly and arrange safe transportation. Explore life on the African Savannah at the Museum of Natural History on the UW-Stevens Point campus. Or grab a photo op on the oversized bench at the Stevens Point Sculpture Park, just off the Green Circle Trail. Crazy about fly fishing? The Tomorrow River, a trout stream in eastern Portage County, is the perfect place to put your skills to the test. Not sure where to start? Call a local fishing guide, like Blackwater Fly Fishing. Get in the saddle and try horseback riding offered on 90-acres of Wild West Campground & Corral. Looking for seasonal fun? Wild West offers horse-drawn sleigh rides through the winter woods, when conditions exist.